Climate change refers to significant changes in global temperature, precipitation, wind patterns and other measures of climate that occur over several decades or longer. 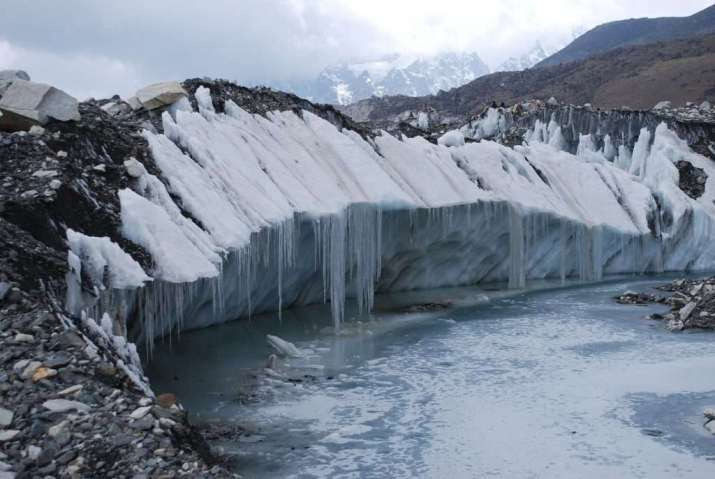 According to a new study, the glaciers of the Himalayan mountain rage are under serious threat from climate change. The report warns that at least a third of the ice will have melted by the end of the century, threatening the water supply of close to 2 billion people in the region. In the early 1960s scientists recognized that carbon dioxide in the atmosphere was increasing. Later they discovered that methane, nitrous oxide and other gases were rising. Because these gases trap heat and warm the Earth, as a greenhouse traps heat from the sun, scientists concluded that increasing levels of “greenhouse gases” would increase global warming. Even if current efforts to reduce climate change have effect and carbon emissions are drastically cut, halting global warming at 1.5 degrees Celsius, 36 per cent of the glaciers along the Hindu Kush-Himalaya (HKH) mountain rage will have disappeared by 2100, the 600-page study warns. If efforts to limit climate change fail, the impact could be much worse; a global warming of 2 degrees Celsius could affect as much as two-thirds of the icefields. These shocking findings were published earlier this month in a ground-breaking study released by the International Centre for Integrated Mountain Development (ICIMOD), an intergovernmental organization focused on environmental and social change in the HKH region. The report, compiled by 200 researchers over a period of five years—with another 125 experts peer reviewing their work—looks not just at the percentage of glaciers that will melt, but also at the consequences, ranging from food and water security to air pollution and energy demand. The HKH region is sometimes called the planet’s “third pole,” housing more glacial ice than anywhere outside the Artic and Antarctica. The glaciers function as the main water store for the 250 million people who live in the region, and experts estimate that another 1.65 billion rely on the great rivers, such as the Indus, Irrawaddy, Ganges, Mekong, and Yangtze, that flow from the glacier peaks into China, India, Pakistan, and other neighboring nations. Glaciers and ice caps form on land. Glaciers accumulate snow, which over time becomes compressed into ice. On average, glaciers worldwide have been losing mass since at least the 1970s. The report predicts that the melting glaciers will increase river flows through to 2050 and 2060, increasing the risk of rivers and lakes bursting their banks, but that water levels will fall starting in the 2060s, potentially affecting farmers and communities dependent on the rivers for their water supply, not to mention the hydrodams that generate a large proportion of the region’s power supply. Despite the size and the importance of the glacial ice of the HKH mountains, the region is often underrepresented in global climate change reports that tend to focus on other highly vulnerable regions such as Antarctica, the Artic, and low-lying island states or coastal nations. This new study, which was requested by Afghanistan, Bangladesh, Bhutan, China, India, Myanmar, Nepal, and Pakistan, the eight nations that call the mountains their home, changes that. The size and diversity of the region makes it difficult to measure the exact impact of climate change—some glaciers in Afghanistan and Pakistan, for instance, are said to be stable or even growing in size probably due to increased cloud cover that shields them from the sun and a change in the wind flows—but the ICIMOD report shows that approximately 15 per cent of glacial ice in the HKH region has melted since the 1970s, and that even glaciers that are now stable will melt if urgent action is not taken. Ice loss refers to the retreat of sea ice and land ice mass from its historic extents. This retreat of sea ice and land ice is one of two major causes of the current sea level rise.